The names of organic molecules are based on the number of carbon atoms in the longest chain. 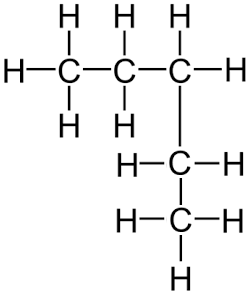 This chain is the longest consecutive line of carbon atoms, even if this line bends. Hydrocarbons are molecules which contain only hydrogen and carbon. The simplest hydrocarbons are alkanes. They contain only single bonds, and have “-ane” in the name. 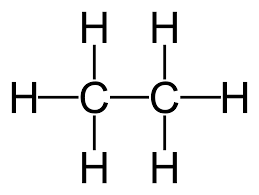 The name “ethane” contains “eth-” because there are 2 carbon atoms in the longest chain, and the name contains “-ane” because the molecule only has single bonds so is an alkane. The name “pentane” contains “pent-” because there are 5 carbon atoms in the longest chain, and the name contains “-ane” because the molecule only has single bonds, so is an alkane. Remember, it does not matter if the longest consecutive line of carbons bends around. For example the displayed formula below still shows a very normal molecule of pentane (5 carbons in a row). 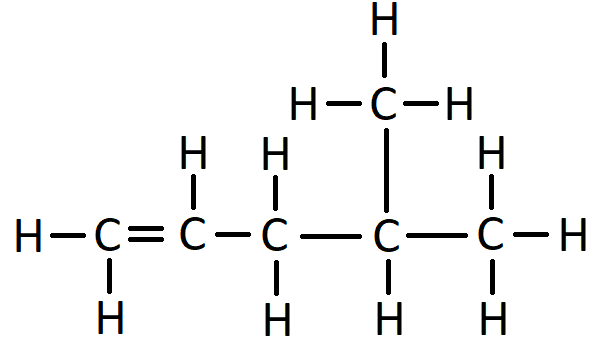 Pentane is not normally drawn with the longest chain of carbons bent around because it could be confusing. You might also see the bonds drawn at angles. Don’t worry, the displayed formula below is still pentane, as can be seen by the fact there are 5 carbon atoms in the longest chain, surrounded by hydrogen atoms bonded to the carbon atoms by single bonds. A shorter way to express the detailed structure of an organic molecule is the structural formula. The structural formula for pentane is CH₃-CH₂-CH₂-CH₂-CH₃, which tells us the same information about the molecule as does the displayed formula, without the hassle of having to draw all the bonds or all the hydrogen atoms. Another simple group of hydrocarbons is the alkenes. They contain a carbon-to-carbon double bond, which also means they have two fewer hydrogen atoms than their corresponding alkane. An alkene has “-ene” in its name. With longer alkene molecules the double bond might appear in different locations of the carbon chain, so the name needs to be a little bit more complicated to be able to describe these differences clearly. A number is added in the middle of the name to indicate at which carbon the double bond starts. The naming conventions for organic molecules cover more than the straight chain molecules. Branched molecules are named depending on the number of carbon atoms in the branch. A branch with 1 carbon is called “methyl” and a branch with 2 carbons is called “ethyl”. This is similar to the conventions covered above, plus the “-yl-” bit just says it is a branch. In the name 2-methyl hexane, the number 2 indicates that when counting along the longest carbon chain the methyl branch comes off the second carbon atom. The “methyl” bit of the name says there is one branch of 1 carbon. The “hex” bit of the name says the longest consecutive chain of carbon atoms is 6. The “ane” bit says the molecule has only single bonds. Another example, this time with 2 methyl branches coming off the second and third carbons of the chain, is 2,3-dimethyl hexane. The “di” in the name indicates there are two methyl groups. This is the same way in which “di” indicates there are two oxygen atoms in carbon dioxide.